This is a reproduction of a game developed by Milton Bradley in the 1850's. 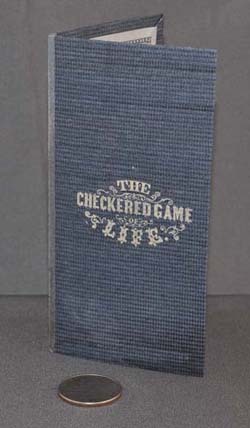 A version of the game was included in a boxed collection of "Games for the Soldiers" during the civil war. The goal is to be the first player to score 100 points by landing on squares that contain a variety of point values. Like in real life, there is an element of chance, each turn contains choices for the player, and subsequent options depend on both chance and result of earlier decisions. 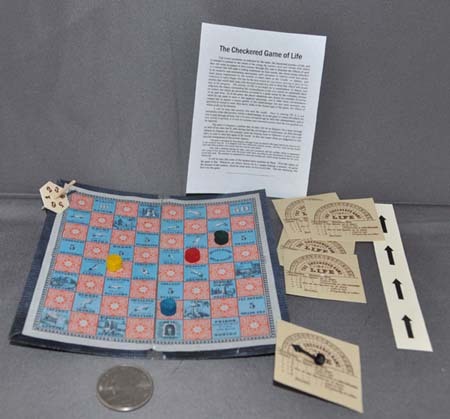 The came comes complete with the miniature game board, rules transcribed from the original, 4 players'pieces as well as 4 scorekeeping cards. For the scorekeeping cards the originals had stamped tin pointers but those weren't practical for this version. 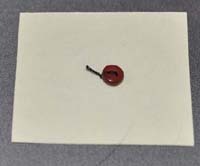 We found a solution (other than to keep score on a piece of paper) is to cut out one of the arrows included on a separate strip of card of cardstock and sew very small buttons on the top and under the card with the threads going through the small circle in the center of the scorekeeping card. 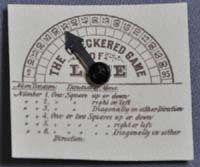 The arrow can then be moved to point to the player's current score and, if the threads are pulled tightly enough, the arrow will have adequate friction to stay in place. In our trial card we didn't try fine elastic thread but that might function as well and be self-tightening. To illustrate how we did the sewing, see the pictures of the front (lower left with a black button) and the back (lower right with the dark pink button). We also include a full-size copy of the rules printed on 8 1/2 x 11 paper. Caution: This game contains small pieces that may constitute a choking hazard and is not intended for children under the age of 3.